Great if you only need to access your passwords on one device and can live without the sync option, but an undeniably useful tool to make life online a little easier. Despite the name, Sticky Password is about more than just remembering and entering your passwords. It can take care of just about any data you are expected to enter online, such as your address, date of birth and phone numbers. Data is secured with AES 256-bit encryption, and there are versions of the program available for Windows, macOS, iOS and Android. There's also a password generator for generating more secure logins, and a secure memo option for saving notes that you'd like to keep private. While Sticky Password is primarily concerned with helping you store and enter online passwords, it can also be used as a vault for the passwords you use to access apps, and it will even attempt to enter passwords when you need to log into apps. It's worth noting that there is also a premium version of Sticky Password available for US$29.99/£19.99 (about AU$40) for a year or US$149.99/£96.99 (about AU$200) for a lifetime license. 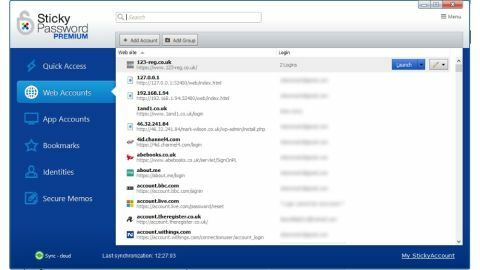 This edition of Sticky Password gives you greater control over the synchronisation of data, notably the ability to sync across devices – if you are particularly concerned about security, you can disable cloud synchronisation so data never leaves your computer. Getting up and running with Sticky Password is very simple, and you're guided through every step of the way. There's a tutorial on hand to help you out the first time you run the program, and a series of video to introduce the various components. Sticky Password has a somewhat old-school look, but it's highly accessible. For the most part, Sticky Password disappears into the background, only needing to be active when you are using it. We like the password rating tool, which judges the strength of your logins, but the cost of upgrading to the premium version is a slight irritant if you want to be untethered from a single device. What is the best free password manager?